A genre rarely approached by women becomes an interesting directorial debut and an impressive example of European storytelling. Megan’s story, an artist based in Dublin, Ireland, married to an Italian architect, takes place between Ireland, South Tyrol and Puglia, where the couple ends up traveling to deal with an inherited building. Megan is fascinated by the local places, but warns a disturbing presence, disclosing the clues to an unsolved family mystery. The film maintains the tension high thanks to an hyper-realistic and clear photography, showing the contrast between the blinding light of southern Italy and the shadows of the house and of the city’s narrow streets. The film was selected by the Bif&St in Bari and at the Ortigia Film Festival, and was awarded the Ortigia Prize for Best Independent Film. 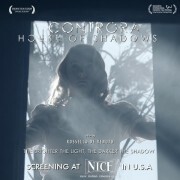 CONTRORA – House of Shadows at N.I.C.E. Special screening of Italian supernatural thriller “House of Shadows” (“Controra”) on Nov. 18! Director Rossella De Venuto in person + FREE entry! New Italian Cinema Events – N.I.C.E. New Italian Cinema Events, in collaboration with the New York Film Academy, presents “House of Shadows” (“Controra”) by Rossella De Venuto, a suspense-oriented film in the giallo tradition (in Italian with English subtitles). http://www.interlineafilm.com/wp/wp-content/uploads/2014/11/controra-interlinea-slider-660.jpg 660 1310 interadmin http://www.interlineafilm.com/wp/wp-content/uploads/2014/10/logo-interlinea-film1.gif interadmin2014-11-10 19:20:172014-12-22 16:49:22CONTRORA - House of Shadows at N.I.C.E.